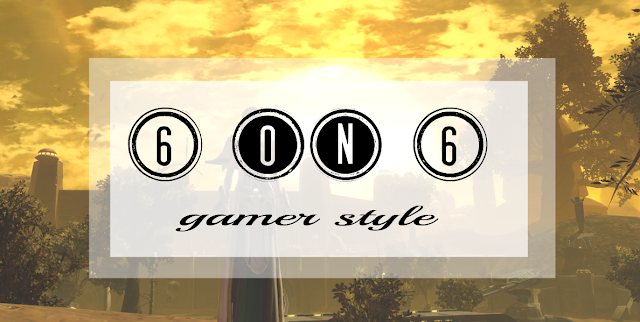 It's the sixth again and that means another 6 on 6! If you don't know what that is, scroll down to the bottom of the post and it's explained there. I loved that this month's colour is yellow, because it's my favourite! At first I was having a hard time thinking of screenshots with yellow in it (I didn't want to go with something obvious such as six pictures of the sun), but eventually I think it worked out pretty well. Here you go. LOTRO: If I have the time, I login to one of my favourite MMOs during breakfast and do some easy tasks. This morning I decided I wanted more Rohirric chairs to decorate my house with, so off I went to do some Hytbold dailies. 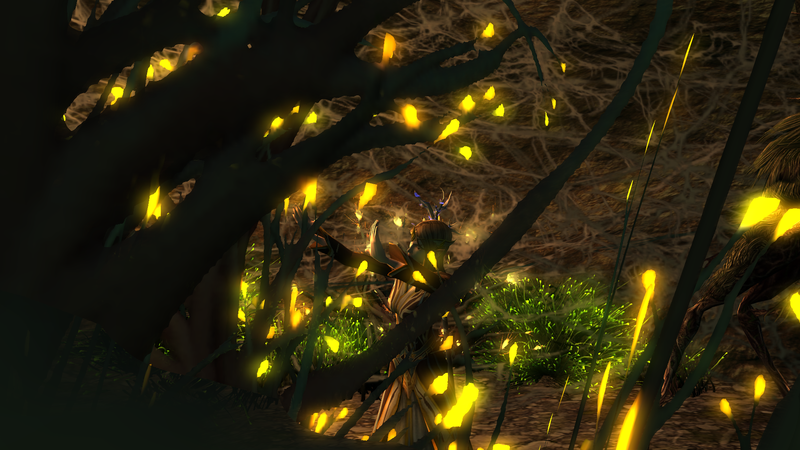 I was still reminiscing the lack of yellow in MMOs when I discovered the cave I needed to rid of spiders was full of beautiful luminescent yellow plants. My elf was rejoicing in them, as you can see above. Spoke too soon. 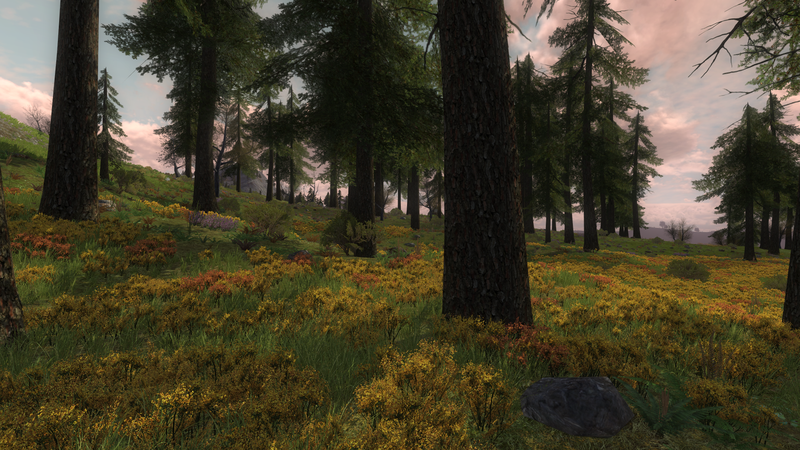 LOTRO: For my next Hytbold daily I had to kill some mounted orcs near Cliving, Rohan... and got confronted with a whole field of yellow flowers. My ability to predict colours is just totally off! Or maybe it's that you start seeing something everywhere once you start looking, as is with many things. 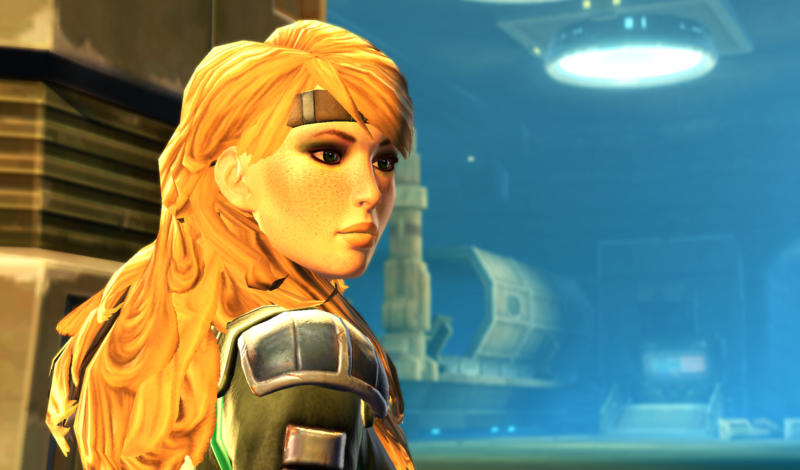 SWTOR: Looking through my file with 6 on 6 preparation pictures (this may sound OCD, but yes, I have such a thing), I found only one in the file labelled "yellow": this one of my bounty hunter. Honeyberry chose her professional name to honour her honey-coloured hair and cute appearance. Together with her counter part Sugarberry, she roams the galaxy as good-looking twins... naturally they're both Dark Side V.
LOTRO: This feels like cheating because I recently used this picture in another post, but I like it too much to skip it. I don't know, there's just something epic about the characters walking, as if they are on a super important quest (in reality they are just on their way to jump of a bridge; you can read more about that here). 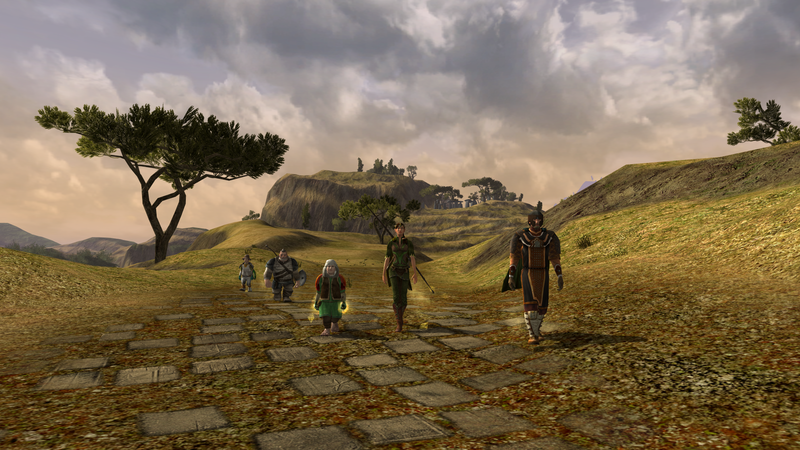 When it comes to yellow environments in Lord of the Rings Online, the Lone-lands are the place to go. The hill-land is pretty barren, with the occasional drought-resistant tree standing around. SWTOR: For this one I had to dip deep into my screenshots archive. I took it on Voss in the first year I was playing Star Wars: the Old Republic, in 2012 - you can tell by the hairstyle I was using at the time. The Voss have a unique way of looking at the force. Their usage of it shows as yellow, much like sage's healing abilities. If you'd like to read more about the Voss as a race (which was newly introduced with SWTOR), I wrote some articles about them recently here and here. 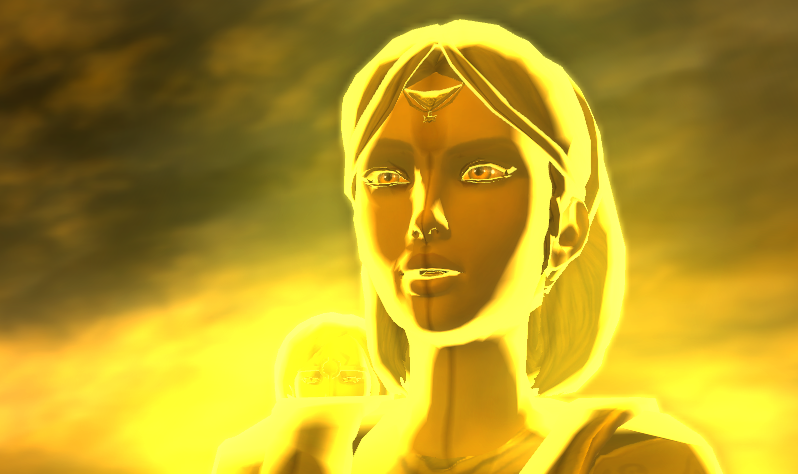 SWTOR: This bonus screenie with an alien in the colour of the month is brought to you by Conrad. This is what he says about her: "I picked this name because in togruta female names, the letter a is extremely prevalent. I didn't think of lieutenant Uhura of Star Trek! For the rest my thought process was: togrutas are really cool and I really want one. I loved the orange montrals and the yellow went really well with it. I also like that yellow is not the most usual skin colour in the game." Ah, Star Wars fangirl problems:P I never got far enough into the game where I could actually customize my weapons and choose a lightsaber crystal...but man, your SWTOR screenies are always so gorgeous that it's tempting to go back! 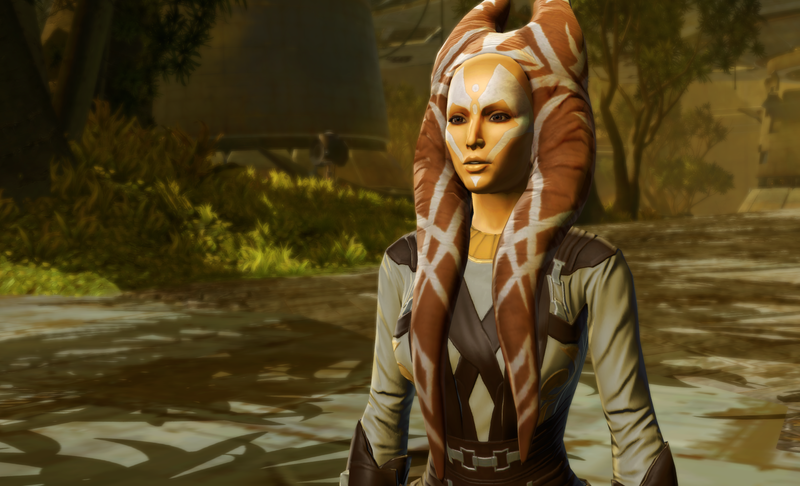 I'm a bit bored with SWTOR atm, but when I look at the screenshots I get reminded that the world looks damn good. I'm sure we had a lightsaber colours topic in the comments at some point, but I can't find it back. Either way, *highfive* for yellow lightsabers! Haha. No, Honeyberry and Sugarberry are just a reference to the twi'lek bounty hunter twins (the "Twin Suns") in KOTOR 2. They look good (or are meant to be, if you don't take KOTOR 2 graphics into account) but are pure evil.